Visual artist Rachael Allen will join forces with Dr Eleanor Holmes (GP, clinical educator and writer – pen name Eliot North) to investigate the creative potential for collaborative engagement across the visual and literary arts through the exchange of experiences as artist and writer, whilst exploring the interface between medicine, health, the arts and humanities. when you called her name. In A&E, wired up and plugged in. family, now laid out for you. you hear your voice say. and read her the rules. Fixers, they don’t wash out. and stuck her hand inside. as I unzipped the body bag. about a topic I knew so well. She used every trick in the book. whilst I put all the organs back. she called out to them. “Call me Poppy,” she said. They waved from the door. It has taken me several weeks to approach this blog post. Wanting so much to write about my experience of our visit to Newcastle medical school anatomy lab; a place Eleanor and I are very familiar with. So much so, we referred to it as ‘going home’. Many times, I have visited the lab to observe the classes, draw the specimens, interact with the teaching staff and technicians, as too has Eleanor. But this time was to prove much more profound for me. Unforgettable and a first time experience in fact. Brian Thompson, the lab technician, escorted us around the dissecting workshop – the place where donated bodies (deceased people) arrive to be embalmed, prepared, labelled and classified, refrigerated, dissected, prosected, groomed and finally laid in their coffin for cremation. Once an individual’s teaching stint is over, their body parts will be gathered together and arranged in the coffin in an anatomically accurate manner. An acute image: head and neck with exposed cranium, prosected thorax, dismembered arms, extracted heart, liver and kidneys, prepared pelvis and perineum, dissected lower limbs and a clinical waste bag of flesh and fascia. 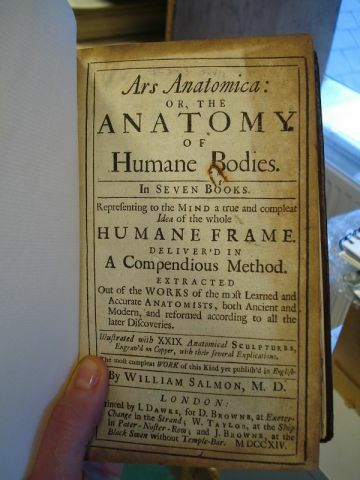 Having taught in ‘parts’, the donor’s body returns to a hypothetical ‘whole’. I’d never realised this was the procedure, and to be honest, it was humbling to learn they were treated with such reverence at the end of their teaching lives (or rather, deaths). Eleanor and I asked Brian to supply us with a full body specimen for the day so we could hold our own study session in the DR. Embalmed only last year, this gentleman was as fresh as they came. His skin was a deep beige colour with light shades of fleshy pink and greens. Applying finger pressure to his skin, I could feel is solidified interior. A stiff armature from within. Together, we were interested in hearing each others approach to the body – what moved us to vocalise, write and draw. For me, it is, and always has been, the bodily material and life evoking features. Moles, pimples, pores, scars, hair, nails, skin imprints. Signs that the body once replenished repaired and protected itself. From the onset, my right hand was itching to draw. I had an appetite for the organic line. I drew myself closer to his body, crouching over his head and neck, peering into his open mouth and nasal cavities. His rigid expression of a silenced yell. The dictaphone was recording our discussions as we described him laid out before us, navigating from his head to his feet, stroking, probing, cupping and lightly squeezing. Quite suddenly, I came over all faint. My temperature shot up and I began to sweat, experiencing a sickness as though I was being alerted to the possibility of vomiting. Eleanor continued talking unknowingly until it became clear I wasn’t feeling well. At the time, I had no idea what was happening. It was frightening. I panicked. Running for the toilet, I collapsed and blacked out. Vasovagal syncope. I had fainted. It’s really very common for this to happen in the anatomy lab, mostly to first year medical students who have yet to develop their physical and emotional contact with corpses. For me, it felt very much emotional. This man amazed me, bedazzled me, with his corporeal ‘fleshy’ presence that embodied such histories of touch and intimacy that enlivened my imagination and absorbed all my attention. It’s an experience I have often in the lab, but today felt more intense. I recovered and we headed for lunch, both quite amused by the situation! On returning, we deemed it best to say goodbye and “thank you” to the man to avert any further faints (!) and headed for their in house museum – a small collection of specimen jars and slides. 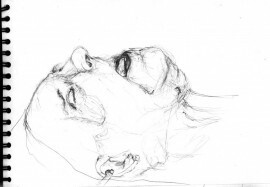 As we sketch together, our general conversations lead us to reflecting on the aesthetics of the corpse to, both in side the teaching environment, in the mortuary and funeral practices. Lyndsey French, another lab technician, shows us a book on embalming with photographs of extraordinary preparation techniques that can turn a severely mutilated head and shoulders of a corpse into a presentable family member for loved ones to view. We enquire about the preparation of the body as it enters the anatomy lab (a story we’ve heard numerous times throughout the project) and decide to delve deeper into its significance. Everyone is prepared the same, with head shaven, positioned on their back, name and history stowed in donor files. Obviously, there are practicalities to such procedures on account of ease of dissection and donor confidentiality, but the essence of such practices is to standardise the body for teaching. Depersonalise, homogenise and ‘normalise’ the body so it is more effective at teaching principal anatomy without the distraction of character aesthetics. This discussion leads us outside the anatomy lab into the clinical context, where this practice of depersonalisation is also found. On entering hospital for treatment, we are gowned, numbered, tagged and ‘patientalised’. We realised that there’s very little difference between the uniformities of the (dead) body in anatomy education and (alive) body in medical practice; it’s the way Western medicine has always preferred to work – body as object. Obviously, this isn’t acknowledging all the efforts that medicine (and the humanities) is currently investing in the generation of more humane, rounded healthcare practices (with this very project making its own contribution to this epic feat!) but there’s still so much work to be done. As we continue to mull over this concept, I am reminded of the title of the project – ‘Lessons in Anatomy’ – which begins to resonate louder than ever before. In these present moments as we are nearing the end of our collaboration, we think that maybe this could be one of the lessons in anatomy we are alluding to. Aside the creditable achievements, awe inspiring developments and life saving discoveries being made by medicine every year, it all comes back to our material existence in the world, and the power medicine has over our flesh. We are putty in their hands. Malleable and impressionable. Perhaps our project is pointing to the reclaiming of our bodies and identities in the face of Western medicine? Accessing our physical (and emotional) truths embodied in our corporeal ‘being’ in a world where systems, policies and procedures threaten governance over of health and wellbeing? The imagination is a powerful tool, and we feel confident that the visual arts and literature are up to the task of realising these lessons in an open and rounded way, together. Rachael Allen is a visual artist and researcher living and working in Newcastle. Her visual artwork and research explores the interface between human sciences, medicine, anatomy and arts methodologies, practicing under the umbrella of medical humanities as well as unholdng an independent practice,nationally and internationally. The past 2 years, Allen has been artist in residence at Newcastle, Northumbria and Durham university anatomy labs, working on various projects and research developing methods of integrating the arts into anatomy pedagogy as well as perform observational research, delivering findings through academic conferences, exhibitions and publications, nationally and internationally.